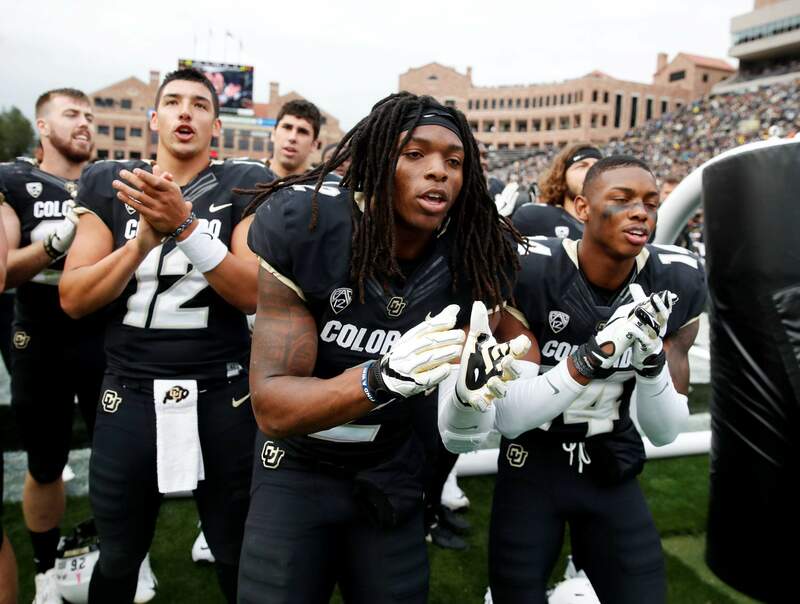 Colorado wide receiver Laviska Shenault Jr. joins teammates to sing the fight song in Boulder. Shenault is a shy, soft-spoken person. That is, until he steps onto the field and transforms into an alter ego he’s nicknamed “Viska 2Live,” becoming an electric playmaker who’s vaulted into the conversation for the Heisman Trophy. 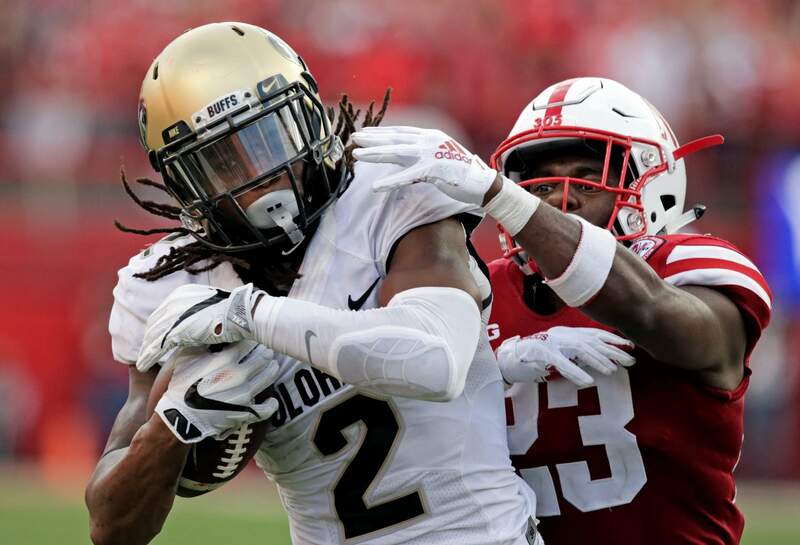 Colorado wide receiver Laviska Shenault Jr. (2) makes a touchdown reception against Nebraska defensive back Dicaprio Bootle (23) during the second half of game in Lincoln, Neb. BOULDER – Away from the field, he’s just Laviska Shenault Jr. – a mild-mannered, soft-spoken person who doesn’t like the spotlight. Once he steps onto it, the Colorado sophomore receiver transforms into an alter ego he’s nicknamed “Viska 2Live” – a play-making wizard who’s vaulted into the conversation for the Heisman Trophy. That humbleness and being the best he can be is his way of honoring his father , who died while getting out of the car to change drivers in 2009 while the family was returning home from a pool party. Shenault Jr. was only 10 at the time and a passenger in the vehicle. Ever since, he’s grown out his dreadlock hair as a tribute to his dad . After touchdowns, he points toward the sky – for dad. His moves are straight out of a Madden video game. Then again, he and his father, Laviska Shenault Sr., spent hours playing the football video game, uncovering formations they liked and then heading into the backyard or the street to rehearse them. No wonder the 6-foot-2, 220-pound wideout from DeSoto, Texas, is so dynamic from multiple positions on the field. As a receiver, he’s caught 60 passes for 780 yards and six TDs. His 130 yards receiving per game lead the nation . As a tailback in the wildcat formation, he’s scored five times, including a 49-yard scamper last weekend at Southern California during a 31-20 loss. Hard to tell for a receiver who also fancies himself a basketball player. He didn’t play throughout high school, though, because he was asked to cut his hair. He couldn’t. It has too much meaning. He keeps it long for his father, who never had him cut his hair. On the day of the accident, the family was returning from a barbecue at a swimming pool when they pulled over to switch drivers. Shenault Sr. was on his way to the driver’s side, when he slipped and stumbled into the street and was hit by another vehicle. All five of their kids were in the car at the time. The accident remains difficult for Shenault to talk about. Like learning to ride a bike without training wheels at 3. Or winning Monopoly on family game nights. Or bursting on the scene in a big way this season with 388 yards receiving over his opening two games. One of Shenault’s good friends on the Buffaloes is fellow wideout K.D. Nixon, who’s also from DeSoto. They’ve been going to school together since middle school and are tight. Really, though, all of the receivers have developed a bond. They’ve organized offseason workouts with Montez to enhance their rapport. About Shenault’s alter ego, “Viska 2Live” – his Twitter handle – he developed the persona to help him flip the switch into game mode. His play is certainly generating some Heisman buzz, even if he doesn’t pay any notice.